So, you've decided to get a Standard Schnauzer? There are really good Standard Schnauzer breeders who have the right puppy for you - but how do you find them? Everybody knows you should get your puppy from "a good breeder." But how can you tell the good guys from the bad guys? 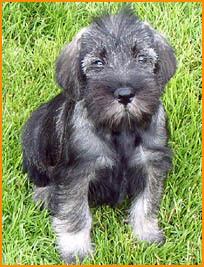 If you've never bought a Schnauzer puppy before, how do you avoid buying one from a "backstreet breeder" or puppy mill? These are people who just breed puppies for profit and sell them to the first person who turns up with the cash. Unhappily, this can end in heartbreak for a family when their puppy develops health or temperament problems due to poor breeding years later. Good Standard Schnauzer breeders will only breed from dogs which have been carefully selected for size, temperament, health and lineage. There are plenty out there - it's just a question of finding one. The good news is that there are signs - sometimes called traffic lights! - that can help the savvy buyer spot a good breeder. They keep the dogs in the home and as part of the family - not outside in kennel runs. You should also make sure the area where the puppies are kept is clean. They have Standard Schnauzers who appear happy and healthy. The dogs are excited to meet new people, and don't shy away from visitors. A good dog breeder will encourage you to spend time with the puppy's parents - or at least the the pup's mother - when you visit. They want your entire family to meet the puppy and are happy for you to make several visits. They breed only one or two types of dogs (maybe Standard Schnauzers and Miniatures) AND they are very familiar with the "breed standards". 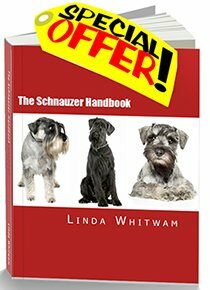 Follow the links at the bottom of this page to find out the exact breed standards for Standard Schnauzers. All purebreds and pedigrees have some potential genetic weaknesses. A good breeder should explain these and should have documents to prove that both parents are free from any genetic defects. Responsible Standard Schnauzer breeders should provide you with a written contract and health guarantee and allow you plenty of time to read it. 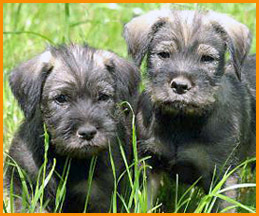 Good Miniature Schnauzer breeders will also show you records of the puppy's veterinary visits and explain what vaccinations your new puppy will need. Gives you guidance on caring and training for your puppy and is available for your assistance after you take your puppy home. They feed their dogs high quality "premium" dog food. They don't always have puppies available, but will keep a list of interested people for the next available litter. And finally...... good Standard Schnauzer breeders will provide references of other families who have bought their puppies. Make sure you call at least one. Happy, healthy puppies are what we all want. 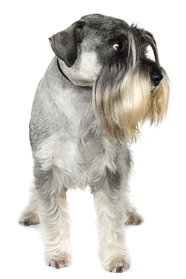 Taking the time now to find responsible Standard Schnauzer breeders is time well spent. It could save you a lot of time, money and worry in the future and help to ensure that you and your chosen puppy are happy together for many years to come.